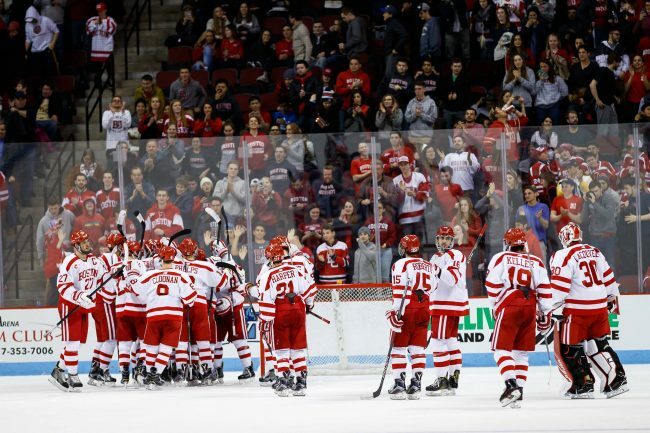 Forward Hank Crone will not be returning to the Boston University men’s hockey team. The Cedar Hill, Texas native had 12 points in 35 games with the Terriers. Crone will transfer to the University of Denver for the 2019-20 season. Crone will rejoin the Fargo Force of the USHL next season. Prior to the Terriers, Crone had 99 points in 106 games for the Force. He finished tied for third in the USHL while playing for the Force during the 2016-17 season with 62 points. How are BU hockey’s freshmen for 2017-18 faring? Boston University commit, Shane Bowers, has aced his midterm. When NHL Central Scouting released its midterm rankings of players eligible for the 2017 NHL Draft, it ranked the Halifax-born center as the 13th-best amongst North American skaters. Bowers has played in all 33 games for the United States Hockey League’s Waterloo Blackhawks. His 10 goals and 24 points are good for second best on his team and puts him on track to beat last year’s numbers. Only 17, Bowers could be another offensive powerhouse on the Terrier roster. He may have been the only projected newcomer to make the midterm rankings, but of all the likely freshmen for 2017-18, he isn’t the only one having a notable season. Henry (Hank) Crone may only be 5-foot-8, but he packs a punch. The Texas native could be compared to the notoriously short and spunky Boston Bruin, Brad Marchand. Like Marchand, Crone spends a decent amount of time in the box, but that doesn’t prevent him from being productive. The winger has accumulated 31 points in 29 games with the Fargo Force, seventh-best among all USHL players. David Farrance and Brady Tkachuk have been logging minutes on the U.S. National Under-18 Team. 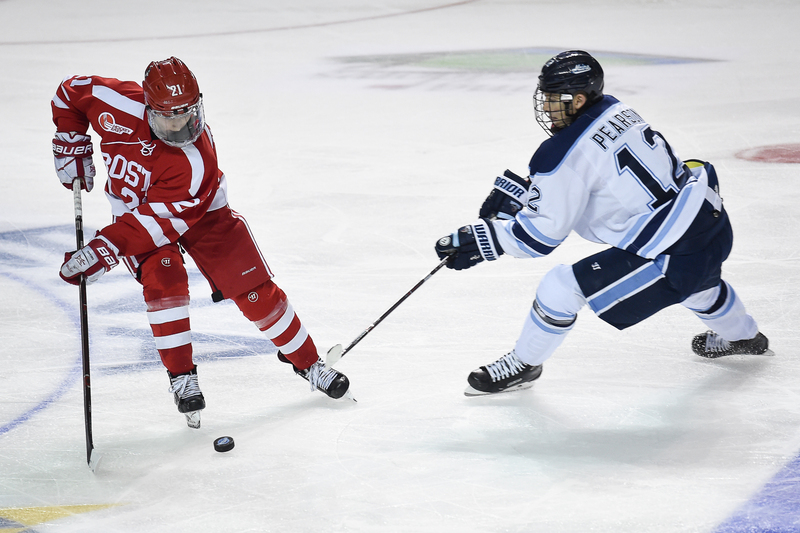 At 5-foot-11, Farrance will likely never be the biggest man on the ice, but he’s been a strong presence on the blue line. As a defender, it’s no surprise he’s only netted five goals, but he also has 15 assists under his belt. The New York native has played in all 37 games and contributes to a penalty kill with an 85.1 percent success rate. Tkachuk has family roots aplenty in the NHL. He could follow suit, as he’s eligible for the 2018 draft and putting up impressive numbers. He averages almost three shots on goal a game, and has the second most points among his teammates with 28. Tkachuk has consistently netted 15 or more goals in the previous three seasons, and between his 11 goals with the Under-18 team and five goals with the USA Hockey National Team Development Program, he’s already accomplished that. 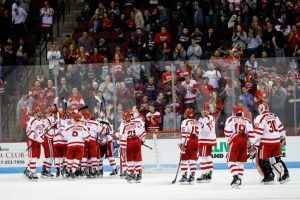 Four members of the current freshman class – goaltender Jake Oettinger, forwards Clayton Keller and Kieffer Bellows and defenseman Chad Krys – all carried their success on the Under-18 team to Terrier ice. Farrance and Tkachuk will likely do the same. In his rookie season in the British Columbia Hockey League, forward Ty Amonte has played in all 41 games for the Penticton Vees. Earlier in the season, he boasted a nine-game point streak. While the Norwell native has only scored one point in the past nine games, he’s still a top producer for the team. He’s recorded 12 goals and 17 assists. Finnish skater Kasper Kotkansalo has missed six games due to injury during his season with the Sioux Falls Stampede of the USHL, but has impressed nonetheless. The 6-foot-2 defenseman is expected to go in the middle rounds of the 2017 NHL Draft. Cameron Crotty is also a notable prospect for the 2017 Draft, according to eliteprospects.com. The defenseman from Ontario has contributed eight points, including a game-winning goal, to the Brockville Braves of the Central Canadian Hockey League. He’s only played in 25 games this season, but his 0.32 points per game average from last season has persisted. The current Terrier freshmen class has drawn national attention thanks to its stunning abilities and maturity. The amount of talent in the 2016-17 group will be hard to top, but the new wave of players projected to arrive on campus next fall will undoubtedly bring promise of continued success for the team.